"I think that professor [Gerardi] is a very sincere and precise and immaculate neurologist. Like me, he came across these patients who developed the side effects and the macrophagic myofasciitis following the HPV vaccine, the Hepatitis vaccine, but he did excellent work... At the beginning, nobody believes him, and even may claim that he's a charlatan, and I have to say that, for my experience, both in Israel, as well as in Denmark, for instance, one of the countries where we have a large number of subjects who suffer the severe side effect, especially from the HPV. People see these cases in which, immediately after the vaccine, or very close to the vaccine, healthy girls who were apparently athletic, and suddenly, they find themself wheel chaired or bed ridden." "Another aspect is primary ovarian failure, this means that these young girls, suddenly, they find themself not being able to be pregnant, and the reason is that the aluminum destroyed or affect the maturation of the eggs in the ovaries. It has been reported in several cases, it's still under reported, because many of those girls are on contraceptive pills, and therefore, they delay the diagnosis only after they will stop or discontinue to take these contraceptive pills, but it has been shown that if you inject aluminum into mice, you destroy or you affect the maturation of the eggs in the ovaries. "In fact, for almost everything else you can think of, you have to do that, you have to demonstrate that something is safe first. That has never been necessary for aluminum, it has never been demonstrated that aluminum is safe. No, there's never been any legislation in order to do that, and this is a historical thing." "Man, only 120 to 30 years ago, learned how to take that aluminum silicone and oxygen and turn it into aluminum metal, and aluminum salts, and held in the aluminum age. Our Earth, living things on the Earth and humans, primarily we're talking about, have only been experiencing aluminum, biologically reactive aluminum, for 120/150 years. We are at that stage in evolution when it's toxic. We haven't had the chance for aluminum to be incorporated into anything living, and used beneficially." "Yeah, right now, we're just accepting the consequences of taking this very biologically reaction metal, living with it, and accepting what it does, without any attempt to protect ourselves from it. Actually, opposite to that, really covering up the damage that we probably know that it does already, for example, in the recent EMA, European Medicine's Agency review of the HP vaccine, how many experts on aluminum did they consult? None. How can they get that aspect if they cannot consulted anybody, and this happens all of the time, all of the time." "You have this fantasy of, I think it's the World Health Organization, giving a safe limit for aluminum, and they say, as long as it's low, one milligram per kilogram body weight per day, you're safe. I asked them, how do you know that, when I don't know it? I've been working on aluminum for 30 odd years, trying to understand it, you know this. I asked them for the details, how did you work this out, and who did it?" "You know, the one thing I hope is this, I actually, like all of us, rely on people like the World Health Organization. I hope that in everything else, other than aluminum, they do consult experts, and they are correct, so when they're telling us about the levels of certain PCB's or something in the environment, I hope that they're not as wrong as they are with aluminum, because if they are, then this organization is totally corrupt and useless. In terms of aluminum, it is, and it always will be until they decide to actually talk to people who know." "They have people that I call the aluminum ambassadors... Usually, good scientists all around the world, who are paid by the aluminum industry to say that aluminum is not a problem, but these are not individuals who work on aluminum. Most of them have absolutely no background in aluminum whatsoever. They are individuals, who for example, work on Alzheimer's disease, and then they, whenever someone with the Alzheimer's society, a major charity, asks for advice, they ask this well-known person in Alzheimer's disease, what's the role of aluminum? No, there's nothing to worry about. They don't ask me." "The thing about aluminum and what makes people complacent about aluminum is that you don't see acute events very often from aluminum. Aluminum is not like cyanide or lead, or cadmium. You don't suddenly feel ill and you don't suddenly get ill and die because you've had a single exposure to it. You can, but it would have to be a very high exposure. Aluminum is different, it's this silent visitor. Now, there is a proviso for that, an exception, and I believe the exception to that can be vaccination." "It is clearly not an exception in the vast majority of people, because the vast majority of people receive aluminum adjuvant and do not get severe adverse events, but if it's one percent of people, one percent of millions of people, young women having the HPV vaccine, is a huge number of people suffering severe adverse events. 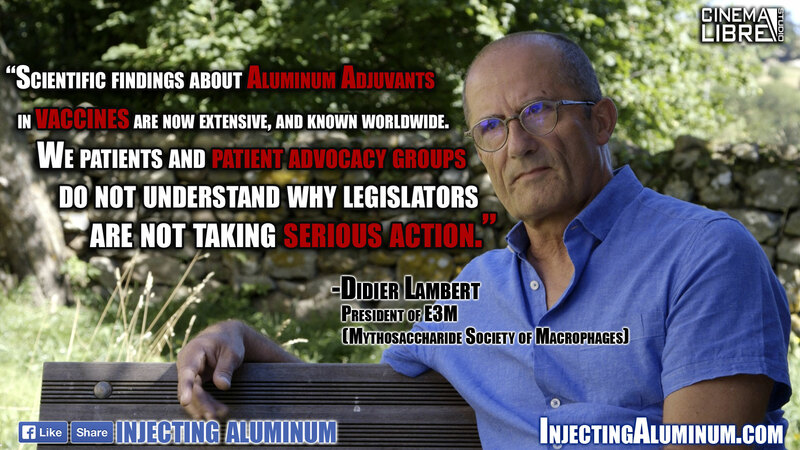 These severe adverse events are unquestionably due to the presence of that aluminum compound." "Aluminum has this amazing ability to turn the body against things that were normally considered as self, so that's why, for example, I am not surprised that aluminum could be involved in something like multiple sclerosis. In multiple sclerosis, we know that the body starts to break down its own myelin, it produces anti bodies against its own myelin product. Why?" "In fact, the adjuvant does not require clinical approval at all. It is the vaccine preparation which requires clinical approval, so you may put any adjuvant into a vaccine, it will then go through a clinical approval process and if it gets approved with that adjuvant, regardless of what it is, whether it's an aluminum adjuvant or another, then it's the vaccine that will be clinically approved, not the adjuvant." "I think it's relatively clear that there are some questions in the field of aluminum research, which most would not like to see answered. I cannot sit here now and tell you, for example, that aluminum is a cause of Alzheimer's, but what I can tell you now is that aluminum does make Alzheimer's worse, aluminum does make Alzheimer's occur at an earlier age, and we know this because when we find such high levels of aluminum as we have in human brain tissue, it is inevitable that that aluminum will contribute to this disease, it is inevitable." "Starting in 2011, because we were backed by enough scientific proof, we contacted French lawmakers. 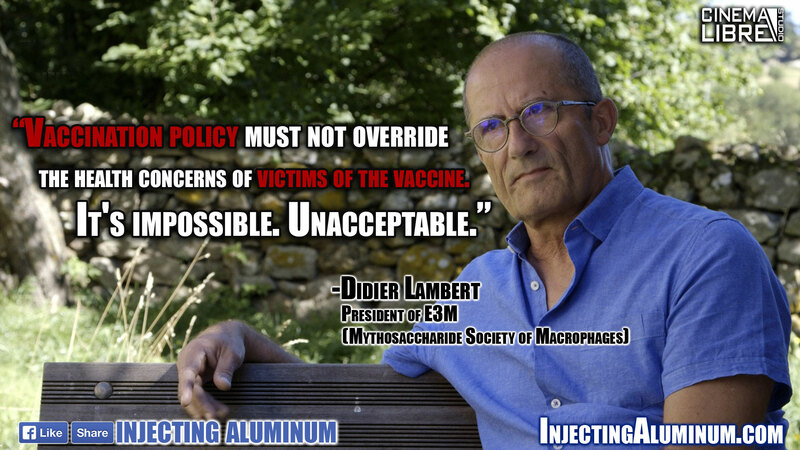 In fact, 260 of them, to date, have intervened on our behalf with the Health Ministry regarding aluminum in vaccines." 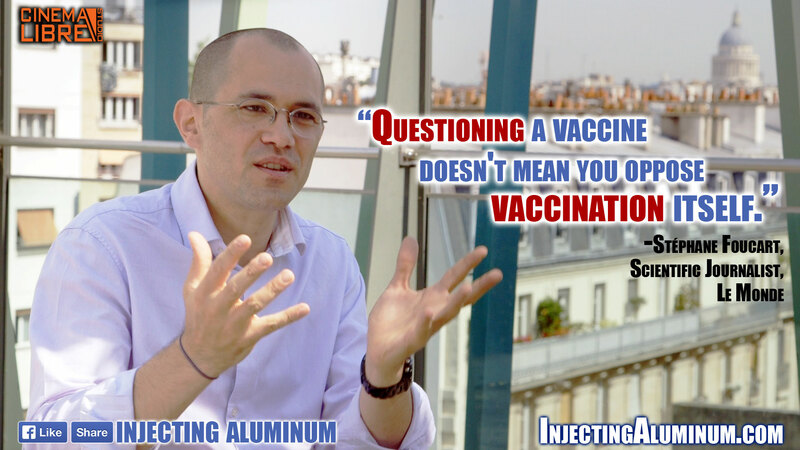 "Scientific findings about aluminum adjuvants in vaccines are now extensive, and known worldwide. We patients and patient advocacy groups do not understand why legislators are not taking serious action." "Sanofi, a French multinational, has a big stake in vaccines. It is the world's largest producer of vaccines. Its majority shareholder is L'Oreal. L'Oreal is the world's largest cosmetics company. L'Oreal's principal shareholders are the Bettencourt family and Nestle. Nestle is the world's largest food-industry corporation. These three corporations have a special interest in aluminum. Sanofi uses aluminum in vaccines. L'Oreal uses it in cosmetics, and Nestle, in food packaging, infant formula, etc. Note that the people who oppose the research by Drs. Gherardi and Authier are mainly financed by either Sanofi or the Bettencourt Foundation. Is that a coincidence?" "In particular, as early as 1974, the Institut Pasteur developed calcium-phosphate adjuvants to replace aluminum salts in all of its products... Dr. Floret, president of the Vaccination Technical Committee admitted that the calcium phosphate adjuvant was no less effective than aluminum hydroxide, or aluminum salts. The adjuvant could be brought back. All it takes is a political decision. Then our vaccines would be safer." "So, in 1986, Institut Merieux decided to eliminate its calcium-phosphate vaccine line. But Institut Merieux also long manufactured a vaccine without any adjuvant at all. Sanofi, which bought out Institut Merieux decided to get rid of the adjuvant-free vaccine in 2008. In particular, the DTaP (Diphtheria, Tetanus, and Polio) which functioned well for forty years." "In late 2012, the Council of State acknowledged the link between our disease and the aluminum in the vaccines. They have handed down eight rulings since 2012. A strong legal precedent has been set." "Vaccination policy must not override the health concerns of victims of the vaccine. It's impossible. Unacceptable." "I can't help but suspect the drug manufacturers of exerting pressure on French public health officials. The aluminum-free DTaP costs much less than the vaccine which is on the market today. There's something else that arouses my suspicion. I doubt it's a coincidence if the vaccine is out of stock. The three mandatory valents, diphtheria, tetanus, and polio, which cost less than 10-valent vaccines, are not profitable. So, oddly enough, there are none in stock. That forces patients to buy vaccines that go beyond the three mandatory immunizations. They're much more expensive, increasing Sanofi's profits." "The lab reported back to us that the tissues contained aluminum. But we hit the jackpot: 100% of our MMF patients had been vaccinated. It often dated back months or years before symptom onset. That's how we gradually connected the dots. Finally, we were certain that the MMF lesions observed under the microscope were actually proof of the persistence, over a very long term, of the aluminum hydroxide adjuvant that has long been used to make vaccines." "These two clinics enabled us to observe that all the patients whose biopsies showed a macrophagic myofasciitis, the lesion containing aluminum salts, presented the same clinical symptoms: Taken together, about 90% complained of muscle pains. About 50% complained of pains in the joints. They also presented fatigue, which we soon identified as a major component in the panel of symptoms. It was present in 80 or 90% of these patients. They also complained of cognitive disorders. Patients told us "I'm not as sharp as I used to be. A pattern of anomalies emerged fairly clearly. Certain types of memory were impacted, in particular. More complex tests showed there was probably an organic lesion in the brain." "Note that aluminum hydroxide became available in 1927. The same compound that is used in 2016! It hasn't changed at all. With the most careful attention, I studied all of the literature prior to Macrophagic Myofasciitis. All of what was known, or thought to be known, on aluminum adjuvants. It's all wrong. Totally wrong. Everything is wrong, because it is fragmentary and incomplete." "The study cited as a reference on how the body absorbs the aluminum adjuvant in a vaccine dates from 1997. It was carried out by an American researcher named Flarend. His co-author is Stanley Hem, the pope of adjuvants. Their work consisted of injecting an aluminum isotope - radioactive aluminum - into two rabbits. Only two bunnies! These two rabbits received intramuscular injections. Scientists then monitored the rate at which the rabbits could eliminate the radioactive aluminum, by measuring the levels of aluminum in the rabbits' urine. The result of this test, in itself, is quite alarming. Elimination, 28 days post-injection, was 6%. In other words, 94% of the aluminum remained in the animal's body. 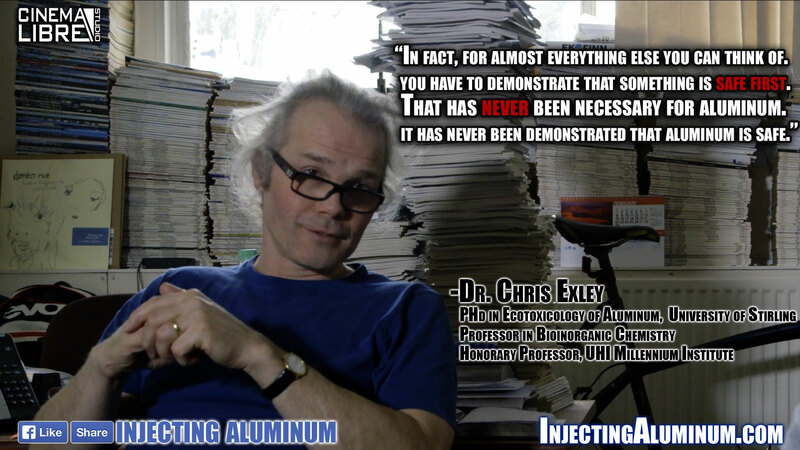 Despite this study, scientists still claim that it only takes a few weeks to eliminate aluminum injected into humans. Worse, the researchers "lost" the animals' bones. Bones are known to be one of the sites where the body stores aluminum. So, besides using only two rabbits, the researchers lost both femurs of both rabbits. Unfortunately, they were destroyed. How silly. The muscle that was injected was not examined. In other words, they couldn't determine whether the injected aluminum stayed there, or not. Moreover, we find ourselves with a study lasting only 28 days. Whereas now, there is no doubt that the adjuvant stays in the body for years. This study, which says, "Nothing's amiss; very little is absorbed by the brain." Perhaps, after 28 days. But how about 6 months, a year, or 18 months post-injection? So this is the study that worldwide vaccinology takes as its reference. Two rabbits, whose organs were lost, and who were studied for 28 days. The study simply has to be done all over again, properly!" "Not one of the experts who has studied the material we have compiled on MMF... And I am speaking of experts in their own capacity. I'm not talking about...experts from public agency staff. I really mean independent experts we've asked to assess our research and give an opinion. Not one of them is free of strong connections to the vaccine industry. That's all I can say." "Researchers checked for a link between multiple sclerosis and hepatitis B vaccine. An association between the two was found in the studies that looked at the vaccination in the long term, and saw a phenomenon. I mean Hernan's research, and Tardieu's work on childhood-onset MS. It took three years for the increase in risk to be visible. In the first few years, it was unobservable. No acute toxicity. When they say "the innocuity of these adjuvants has been proven," beware of the semantics! Stop! They are innocuous - in the short term. But you can't say they are innocuous in the long term, because you don't know: no studies have been done." "The guiltiest act is that once it has been pointed out that the aluminum persists for much longer than a month, that it remains in the immune system for many years, no watchdog agency sat up and said, "Stop. Back to the laboratory, guys." That should have been done in the early 2000s. And it was not. So we're fifteen years late, in terms of the natural reaction elicited by the normal application of intellectual discipline." "We analyzed the process whereby a macrophage ingests a particle. The macrophage behaves the same way, whether it is eating an infectious particle, a bacteria, or a particle of metal the size of a bacteria. It surrounds the intruder, bringing it inside its cell membrane. Then it develops a strategy for eliminating this toxic particle it has eaten. The technical name for the system is "autophagic xenophagy." It consists of isolating the toxin inside a double-walled sac. A sac with two membranes. That way, the alien invader is isolated. Next, the macrophage fuses with an organic killer, the lysosome. The lysosome fuses with the sac, or vacuole, and destroys everything inside. The lysosome contains highly destructive enzymes. They only operate at acidic pH, so it has an acidic pH. The enzymes kill living organisms like bacteria. They can also kill proteins or old mitochondria - any cellular waste material. But the pH, or acidity, is capable of corroding or dissolving mineral substances. To dissolve a mineral substance, you immerse it in an acidic environment, and it melts: it goes from being a solid to being a liquid. That's what usually happens to mineral particles. That's why we figured the flaw might be in the autophagy-xenophagy system." "We know there are 34 genes which code for this highly complex machinery. So we looked for 109 variants; that is, genetic variations on each of these genes. They are "normal." That means the mutations do not cause disease in and of themselves. But they do predispose the system to dysfunctions. Of the 109 variants we checked out, we found 7 variants, located on six different genes, which are significantly found more frequently in patients with MMF, as compared to the general public. There are international consensus guidelines indicating normal ranges. It is interesting to note that these genetic mutations are cumulative. That is, our MMF patients present more than one variation. They have three, four, or five, and their effects probably combine. As a result, in a normal situation, when the macrophage just performs standard duties, it works fine. If the job makes extra demands on the macrophage, most people overcome the difficulty, with a struggle. But a small minority will be totally unable to secrete the enzyme, and the toxin will remain. If 10, 20, or 25 vaccines are administered, regardless of genes, everyone will be overcome by the toxic burden. The cause of the system breakdown will be the toxicity itself. " 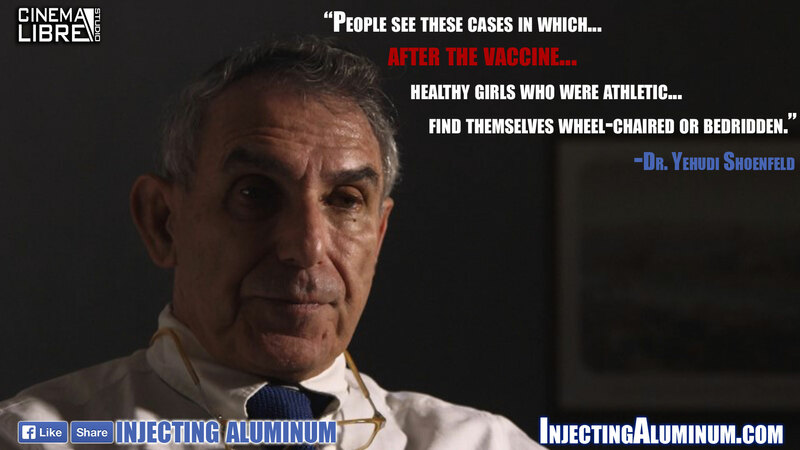 "In the US, infants receive 16 shots containing aluminum by age 18 months. Sources say there are between 120 and 200 vaccines being developed. What if they are tested only in relation to themselves? They say, "This is safe," and by itself, it is. They never evaluate it combined with a half-dozen or a dozen other vaccines, also administered. If vaccine safety is evaluated only in terms of one injection, instead of in terms of the whole series, there will be many catastrophes before we track down the problem. Our research has identified a fundamental mechanism which disrupts the macrophage's ability to detoxify. So the individual is affected. That undoubtedly applies to adjuvants, because we studied the phenotypes of 365 patients, a sizable sample. 93% of them have more than one mutation, compared to only 14% in the general public. That's a big difference. Naturally, additional research is needed." "It must be demonstrated that the inability to detoxify aggravates neurotoxic effects in animals, for example. It sounds easy to prove, but it will require extensive experimentation. In any case, it is the first clue we have found providing an intelligible explanation for this difference between patients with Macrophagic Myofasciitis and other people who are vaccinated whose muscles do not contain Macrophagic Myofasciitis, even though they received identical vaccines. There still hasn't been any call for research that could be permeable to this type of experiment. Currently, it does not exist. " "This subject is not eligible anywhere. It's frightening, but true. It means that research is no longer free to explore. It has been mapped out in advance. That makes it impossible to look beyond the themes that have been prioritized by political-industrial decisions. The research has no right to exist. That's a real problem... So the potential for research into interesting subjects, arising from researchers' creativity...In other words, the cream of the crop of scientific creativity has been stripped of the possibility of obtaining a minimal budget, to stay alive. We'll have to resuscitate it, or die." "If we base ourselves on the fact that when we look at the number of vaccinated patients who have a chronic fatigue syndrome with muscle and joint pain, we come up with an average, after our evaluation procedure, of one third with Macrophagic Myofasciitis. it is possible to estimate there are several thousand, say ten thousand patients in France who may have MMF. That is a large population, and it is certainly a conservative estimate." "We are talking about patients who have histological MMF lesions for unusually long periods of time. That's important to note. The histological lesion we see in the biopsy corresponds to what we call the post-vaccinal granuloma. This granuloma occurs in anyone who receives a vaccination containing aluminum. It is a physiological phenomenon. However, the amount of time the lesion persists is not known precisely, in humans. But we do know, on the basis of lab work with rats, in particular, that the lesion shrinks as time goes on. It disappears within the year following the injection. A lesion in a patient four, five, or six years after a vaccination is an abnormally long persistence. Then we have a real photograph of the patient's condition. We can suggest therapeutic strategies. We don't know how effective they are. This illness is very hard to treat." The oldest adjuvant used in vaccines is aluminum hydroxide... But it was first suspected in the 1960s, as I told you. The adjuvant has adverse effects. It increases immunoglobulin levels. Immunoglobulin E levels are already too high in allergy patients. So there's no reason to raise them even more! Risk of cerebral neurological disorders after products containing aluminum are injected, or after long-term exposure to aluminum dust. If accidents occur in allergic individuals, the Health Ministry will be (or is) fully responsible for them. It cannot say it was not alerted. They were definitely forewarned...The team at Pasteur reacted to the decision, of course. But there was absolutely no response...I think we are really up against a powerful giant. We explain that something's wrong, and they keep saying they haven't heard a thing. They claim no one has said anything. It's appalling. Who didn't know Dr. Relyveld, at Institut Pasteur? He worked mainly on vaccines. And, at the time, he had already spent some ten years studying reports of the problems that might be associated with aluminum. That's why he developed the calcium-phosphate vaccines with an Institut Pasteur patent he also created. That was in the 1970s, I'd say. They were the Institut Pasteur vaccines. The child vaccines marketed by Institut Pasteur. They were used wherever Institut Pasteur sold vaccines: All over the world. In the mid-1980s, Institut Pasteur joined with Institut Merieux IN THE 80'S AND 90'S to form Pasteur-Merieux Serum et Vaccins. According to Marc Girard, who went from being Scientific Director at Pasteur to being Scientific Director at Pasteur-Merieux, "That is when profit prevailed over public health." Because aluminum was preferred to calcium phosphate. Unfortunately, that's what happened." 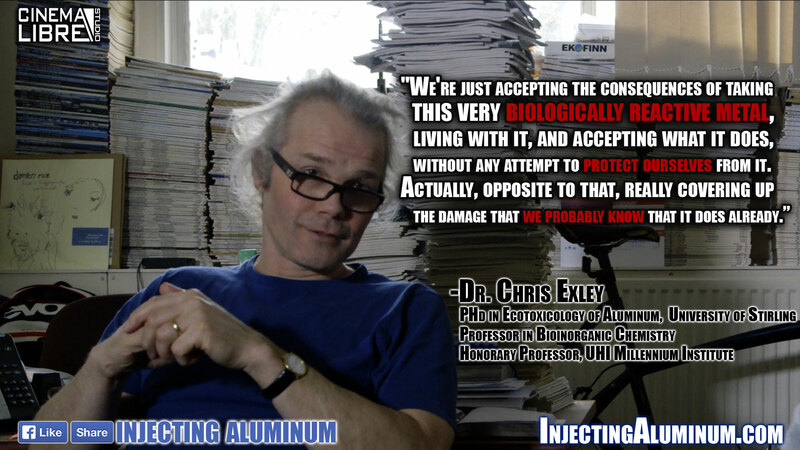 "Several hundred researchers were involved in this first great investigation into aluminum's toxicity. There was a lot at stake, actually. High economic and scientific stakes were attached to aluminum. This large tome was published by an author who long maintained a following. Ernest Ellsworth Smith was recognized as a scientist. He published this book in 1928, over thirty years after the beginning of the controversy. The book is supposed to weigh all the pros and cons. But it is extremely biased. He picks and chooses what he wants, from his sources. He omits any findings that aluminum is harmful. And he concludes with arguments that are not at all scientific. The anti-aluminum side, Smith's opponents, had much less funding, and couldn't afford to publish a book like this one. Starting back then, the match was uneven. Both sides had scientists doing serious, legitimate work. But the pro-aluminum group had sponsorship. That often happens with manufacturing, even today." "They even want us to believe that it is unanimously accepted that aluminum has no toxic effects. The Health Minister is lying! This is not unanimous opinion! The proof is that the study by Drs. Gherardi and Authier was published, and I reviewed it at the National Assembly in France. And it is only one of many studies, worldwide. They show aluminum is a nerve toxin. How can she call that unanimity? Who are they trying to fool? The studies have been published! They show adverse effects, but the industry has taken over. Big Pharma has taken over. Politicians don't want to force the industry to change adjuvants. The manufacturers are used to cheap production chains. They can afford to sell the vaccine at a low price. Yet they still make a healthy profit. The thing that makes me furious, that drives me to spearhead a campaign to hold the Health Minister accountable, is when I wonder if anyone cares about the people! Does anyone care about public health? Isn't anyone listening to all the whistleblowers? Or is money the only thing that speaks to you?" "An adjuvant is not a vaccine. Questioning a vaccine doesn't mean you oppose vaccination itself. That's an important detail, in the analysis of this issue." "Nothing in science says that scientific proof should outweigh public health. That's a political choice. I find it interesting to note that in cases with a strong suspicion or even a moderate suspicion, that a product might damage public health, if it is marketed, "good science" supposedly demands we wait to have definitive proof. Often, that's just impossible. It's impossible. Scientific proof is strong and meaningful. It is obtained only partly through toxicology, only partly through mechanisms which explain how a product acts. Epidemiology also counts. That is, the proof that people really are ill. It's very interesting, because to obtain epidemiological proof, you need epidemiological studies. And those studies require funding for laboratories and scientists. No funding? No proof. And you'll never get any." "You can influence a scientific trial in a number of different ways. The first is to test only a part of the product going on the market. The vaccine without the adjuvants. That's the first way. The second way is simply to purchase your scientists. You can hand-pick the jury that will ultimately decide whether the product is safe. Again, that is common practice among manufacturers of all kinds: pharma, chemicals, agrochemicals...They're on the corporate payroll, as consultants or researchers, or something else. If they are not independent and objective, the public cannot trust their judgment." "The fact that the toxicological study concerns vaccines, not the adjuvant is a profound question... The substance everyone is exposed to is never evaluated. I think that's a profound flaw in the regulatory system. If it isn't settled, people will stop getting vaccines. Their trust in the regulatory system will be eroded. It's already happening. Matters that seemed to be technicalities, like product regulation or approval, have become political issues, and citizens demand action. For vaccines, and for a whole spectrum of products, testing should involve the product to which people are exposed not just the active ingredient."